Lidl continues its Christmas ad campaign in the UK with a new spot, advertising the Deluxe Fresh Broadland Free Range Turkey. 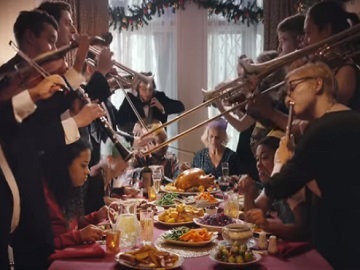 The 20-second spot features Jenny, a woman who – according to the voiceover – upgraded Christmas this year with a Deluxe Fresh Broadland Free Range Turkey from Lidl and by getting a 16-piece orchestra to play in her dining room. While the first move proved to be very inspired, not the same can be told about the second one, the musicians performing right into their heads due to the lack of space in the room. The advert ends with the voiceover saying the tagline “Make Christmas a Lidl special”. From November 8th, the supermarket chain will offer a range of Christmas gifts, such as a Playtive Junior Play Kitchen, a Parkside Toy Power Tool, a Bayer Doll’s Pram Set, a Playtive Junior Vet Play Set, a Ravensburger Board Game, a Clementoni 3D or Fluorescent Puzzle, various family games, diaries and organisers, advent calendars, wrapping paper, scented candles, and more.